National identities in soccer are real. Mostly they emerge from the styles of play and the youth coaching methods that predominate in any given country’s soccer setup, and the values those styles and methods reflect. There is a reason why Brazil are almost always led by graceful and expressive attackers, and why England are always full of energetic workman who love long sprints and hard tackles, and why Spain have what seems like an endless supply of tiny imps who flit about on the ball for 90 minutes, and so on. Germany have one of the most recognizable national identities. And yet we seem to be witnessing the slow de-Germanification of the German national team. The classic German team can play more or less attacking or defensive, more or less possession- or counterattack-focused, but the bedrock of direct, physically dominant play is always there. Recall the way Bayern Munich crushed Barcelona in the Champions League semifinals in 2013 and you’ll know what uncut German soccer looks like. Now, while the German team under manager Joachim Löw has been one of the best German teams ever, they are decidedly not very German. Löw’s Germany play much more like a Spanish team than a German one. The deity Löw’s Germany live to serve is the Possession God. They are all about keeping hold of the ball for as long as possible, cramming the team with as many playmaker types as possible, always looking at opposing defenses as locks to be picked rather than smashed. You could tell in the makeup of the roster how little interest Löw has in making Germany play like a traditional German team. Take his most controversial decision in the lead-in to the World Cup: leaving Manchester City winger Leroy Sané out of the squad. The qualities Sané brings to a team are many of the qualities of a prototypical German winger. He is impossibly fast, super strong, is a monster when running at defenders with open space in front of him, and has a rocket of a shot on him. Sané had a great season this year, and under many managers he would probably be a starter for Germany. Instead of building his team around a star talent like Sané, Löw left him at home. In Sané’s place as probably the last attacker to get into the team is Julian Draxler. Draxler is a good talent, a quick and tricky attacking midfielder with strong creative skills and great dribbling. But he’s nowhere near as good in an objective sense as Sané. Why take Draxler over Sané, then, when the one watching these games from home is so obviously better than the one who’s there with the team? Because Draxler gives Löw the playmaking and possession security his team is built upon. Draxler is more Spanish in style than Sané, and that’s exactly what Löw is looking for. This seems like a good time to point out that Germany’s transformation has unquestionably been a good thing. The success speaks for itself. Under Löw’s guidance, Germany won the last World Cup, made the semifinal of the one before that, got to the semis of both of the last two Euros, and come into this World Cup as one of the big favorites to win. When so many opponents in international tournaments try to sit deep, defend, and hit out on counters, it makes all the sense in the world to combat that with an attacking style that specializes in breaking down deep defenses and neutering counters by making sure they don’t start in the first place. Löw’s choice to make an un-German German team isn’t an abandonment of German tradition or anything like that. Rather, it’s a savvy adaptation to the current reality. Both of Löw’s first two international tournaments in charge of Germany ended in defeat to the ascendent, quintessentially Spanish Spaniards: first in the final of Euro 2008, then in the semis of the 2010 World Cup. “Spain are a wonderful team,” Löw said after that loss in 2010. “They are the masters of the game. You can see it in every pass. 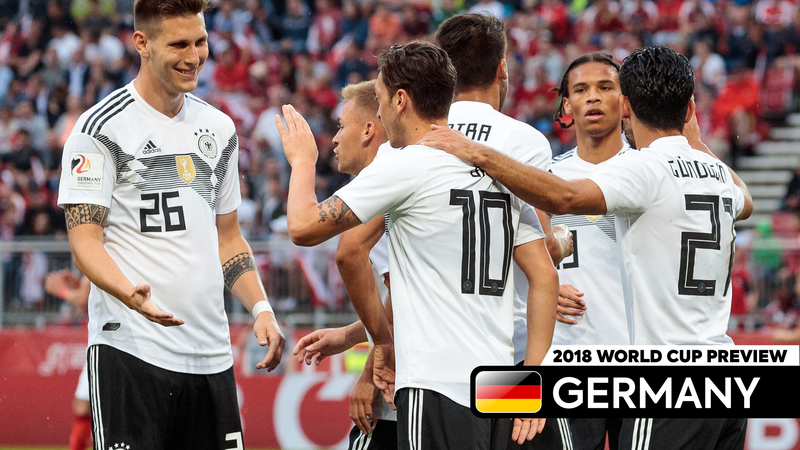 They can hardly be beaten.” Germany learned from those defeats and Spain’s run atop the international game, and now, with German players playing in a Spanish style, they’ve assembled something as strong or maybe even better than what Spain have. Every national team should be so wise and unsentimental when knowing when to deviate from tradition. Sometimes it takes a little deviation to become the best. Even though we’re currently in an era of possession obsession, and even though the players that best embody the possession game are the Xavi-esque controlling midfielders, there’s a distinct paucity of those kinds of midfielders in the game today. It’s telling that the very team that kicked off the possession craze, Barcelona, themselves haven’t been able to find a new one since Xavi left. And yet there is still one true midfield maestro orchestrating beautiful symphonies for club and country, and his name is Toni Kroos. Kroos is a true master of passing. He can pass quick and short and he can pass long, low, and hard. He can pass backwards, forwards, sideways, from in front of his defense and from between the lines of the opposing team. He can hit them with his right foot and his left, be they through balls or cross fielders or anything in between, and all with pin-point accuracy. Crucially, Kroos knows exactly when to play exactly which kind of pass in every scenario. The key to being a great controlling midfielder is knowing what kind of pass any given moment calls for, having the feel for when the opposing defense is vulnerable and so a raking pass out to the wing onto the strong foot of an onrushing winger is the smart play or when the charging run in behind should be ignored in favor of sliding the ball back to a center back to slow down things down. The subtlety of Kroos’s play doesn’t lend itself to highlight reels. Unless you’re watching an actual match, you can’t feel Kroos’s influence in quite the same way. However, it is hypnotic to watch Kroos hit perfect pass after perfect pass, so the highlight reel above will have to suffice until Germany start playing this summer. Once the real games start, you’ll get to see the man’s work the way it’s best appreciated. Reus is the most electric German player of his generation. That’s saying something when it’s been Reus’s peers that have made Germany the World Cup-winning juggernaut they are today. However, while Germany have been out making all this history, Reus has been forced to sit on the sidelines during the biggest moments due to a couple agonizingly timed injuries. He missed the 2014 World Cup by getting hurt in a friendly right before the tournament was set to start, and a couple years later he missed the Euro 2016 in which his teammates got to the semis. Reus is exactly the kind of player Germany have missed during their run in international play, and it’s sucked that such a great player hasn’t been able to showcase his talents on the biggest stages. Until now, that is. Reus only returned from yet another long-term injury a few months ago, but in that short amount of time he already cemented a spot for himself in one of the most talent-loaded national teams in the world. That’s because Reus is a terror on the pitch. He is (or maybe was?) blisteringly fast, so adept at sprinting with the ball at his feet and keeping control of it even with multiple defenders bearing down on him. He’s an expert goalscorer from wide positions, armed with a ghost’s ability to sneak past bodies and a piledriver of a shot when he gets anywhere near the penalty area. He’s an explosive player in every phase of the game, and it’s explosion and goals that Germany need to add the cutting edge to their pretty possessions. After all, a Toni Kroos stroking gorgeous passes around is only effective if there’s a Marco Reus on the end of the passes turning them into goals. You’re not going to believe this, but Germany play a lot like Spain. Specifically, they are ball-hogs. Germany’s philosophy is all about getting on the ball, passing it around until their teammates are all in good position to attack, and then passing it around some more, patiently waiting for the defense to show its throat so Germany can strike. And while Germany’s overarching philosophy is Spanish in nature, they still have enough traditional German-ness in them to spice things up. Timo Werner and Thomas Müller are versatile players who are good on the ball, but they combine those skills with the strength and cussed determination of all great German goalscorers. Their defense is great and has a great mutual understanding since three of the four starters all play together at Bayern Munich. Their attack is amazing per usual, with lots of players who excel at keeping the ball and eventually getting it into the net. If there is one potential weakness, it’s in the center of midfield. Not in terms of its possession and creative duties, since Toni Kroos and Mesut Özil are two of the very best passers in the world. The concern is more about Kroos’s parter in Germany’s 4-2-3-1 double pivot. It’ll probably be Sami Khedira starting alongside Kroos, and Khedira is no longer the player he once was. Khedira is a box-to-box player whose work-rate is still as high as it used to be but at 31 years of age, he no longer has the athleticism and stamina that used to cover for his technical shortcomings. That’s pretty much a nitpick though, as Germany more than most teams have what they want to do and how they want to do it locked in.